New hiring provides the opportunity to hire faculty who are committed to equity, diversity, and inclusion. CEDI has developed a toolkit for search committees and departments in the UWSOM based on best/effective practices in search, selection, promotion and retention of diverse faculty. You will find information about best practices and examples of resources to increase faculty diversity from various sources. Many of the materials were developed through the National Science Foundation ADVANCE programs at UW and universities across the country. Detecting Bias in Letters of Recommendation: This article helps the reader understand the manifestation of bias and detect bias in letters of recommendation in academic medicine. University of Washington Faculty Recruitment Initiative, Office for Faculty Advancement provides supplemental funding for departments to “contribute to the recruitment of faculty whose research, teaching, mentoring, and/or service interests focus on expanding and enriching traditional disciplinary boundaries”. 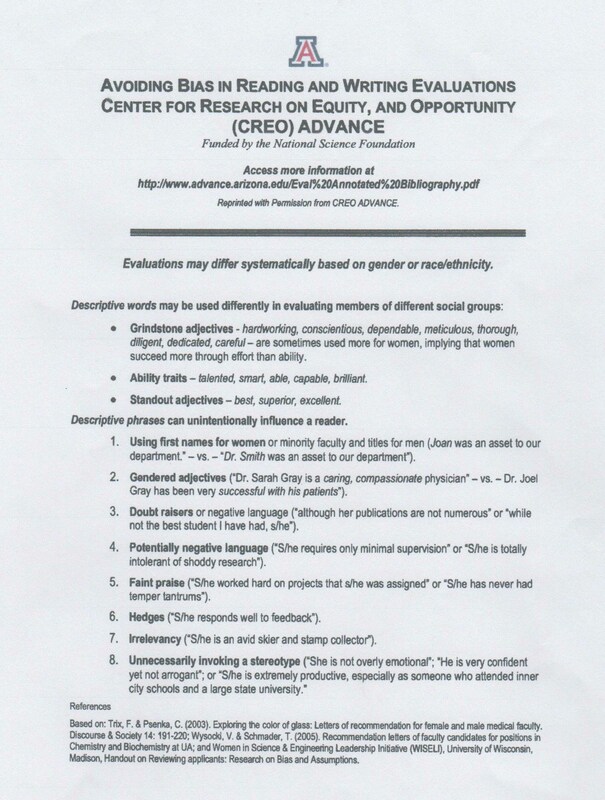 Assessment of diversity activities is gleaned from the CV, not based upon the person’s background. The Greater Washington State Higher Education Recruitment Consortium (GWS HERC) University of Washington and collaborators (i.e. The Bill and Melinda Gates Foundation, Fred Hutchinson Cancer Research Center) have formed a new collaborative effort to help institutions recruit diverse faculty and staff and assist dual-career couples seeking employment throughout the state”. The Association of American Medical Colleges (AAMC) is an excellent resource to access resources to increase diversity in schools of medicine. AAMC features a strategic planning guide, information to assess diversity climate, a Roadmap to Diversity: integrating Holistic Review Practices into Medical School Admissions Process, the Facts and Figures Data Series, and much more.